Second Lieutenant Pershing from the 1892 University of Nebraska yearbook. On 25 September 1891, General Pershing, then a Second Lieutenant in the Sixth Cavalry, became Professor of Military Science and Tactics at the University of Nebraska. Lieutenant Pershing, a graduate of West Point, demanded excellence in his cadets and embarked on a program of discipline and serious military training. He used the manual of arms and drill as the means of instilling a new sense of professionalism and structure with his cadets. He established a system of cadet promotions that recognized students who displayed leadership and skill in military drill and tactics. Enrollment in military courses dramatically increased as students were drawn to the program by Pershing’s positive leadership example. Cadets took pride in themselves and in their corps. Over the next four years Pershing inspired an enthusiasm for drill which few leaders have equaled. In March 1892, Lieutenant Pershing reorganized Company A of the university’s Military Department, as a select company in preparation for the National Competitive Drills in Omaha, Nebraska. As a result of intensive training, Company A had become so proficient in drill that by early June it won the University’s intercompany competitive drills, better known as the “Compet”. The Omaha Cup awarded to Company A on 13 June 1892 by the Citizens of Omaha, Nebraska. For many years it was competed for annually by companies in the student battalion in the intercompany drill “Compet”. The long awaited national drill competition in Omaha began on 13 June 1892, Company A, which had trained for only four months faced veteran companies from all over the Nation. In the “Maiden Prize” competition the company was so exacting in its movements that it completed its prescribed maneuvers in just 23 minutes, well under the 45 minute time limit imposed by the competition. 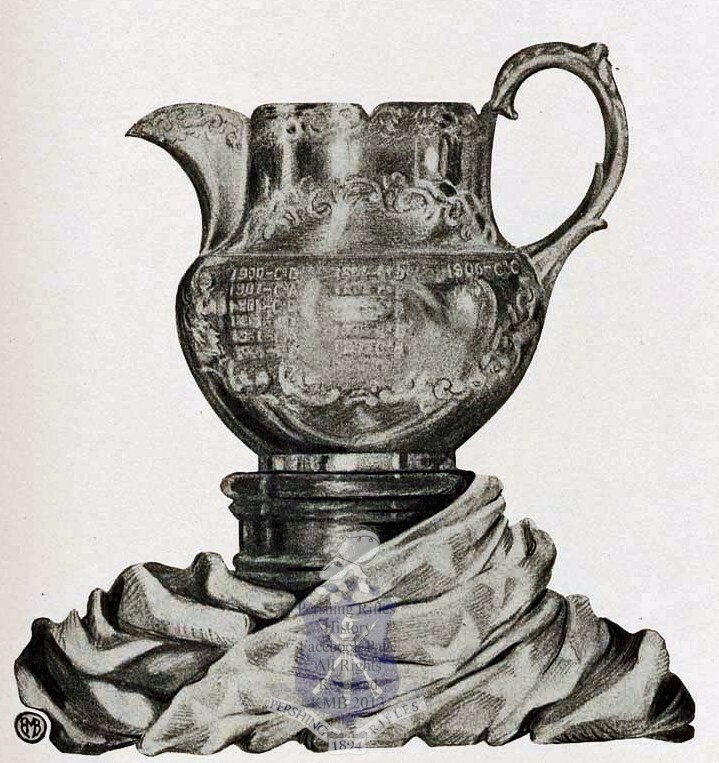 As a result, Company A won the Maiden Prize of $1,500 and the Citizens of Omaha presented them with a large silver cup, the “Omaha Cup”. Although there was a strong desire amongst the University chancellor and cadets to form a permanent “crack company” it wasn’t until 1894 that that a student organization with this goal was established. 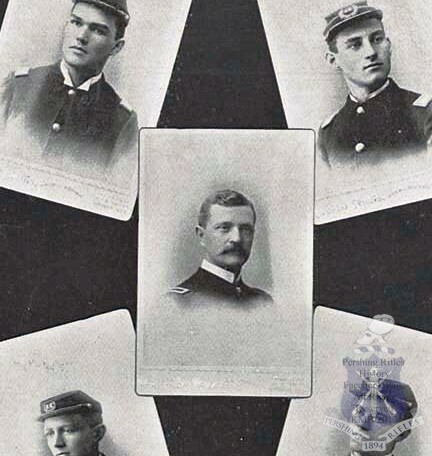 Three of the original Company A members, meeting casually during the summer of 1894, were responsible for the idea of founding the “Varsity Rifles” based on the outstanding drill and leadership example of their mentor Lt Pershing. On Tuesday evening, 2 October 1894, 39 picked cadets and alumni met in the armory to hold their first meeting, Lieutenant Pershing consented to act as temporary drillmaster for the organization. It is this year, 1894, that we recognize as our official founding. When Lieutenant Pershing left the University of Nebraska in 1895 he, at the request of a committee representing Varsity Rifles, gave the unit a pair of his cavalry breeches. The breeches were cut into small pieces and were worn on the uniform as a sign of membership. These “ribbons” were thought to be the first service ribbons worn in the United States. On 1 June 1895, the Varsity Rifles, in honor of the recently departed Lieutenant Pershing, changed its name to the “Pershing Rifles”. In February 1898, Lieutenant Pershing, now an instructor at West Point, gave a flag to the Pershing Rifles which was presented by the University Chancellor. Also for the first time the Pershing Rifles wore on their collars a distinctive pair of crossed rifles with the initials “P.R.”. During the Spanish American War thirty members of the now powerful Pershing Rifles enlisted in the First Nebraska Volunteers. Every one of the thirty distinguished himself in the ensuing battles. W.H. Oury, Captain of the Pershing Rifles, was commissioned and placed in command of Company B of the First Nebraska. Another Rifleman, Charles B.Robbins, was made the unit’s First Sergeant. Robbins served with distinction in the Philippines and later during Mexican Border service and in World War I. He advance in rank from Private to Colonel during his military service and later served as Assistant Secretary of War from 1928 to 29. The first decade of the 20th Century saw the Pershing Rifles reach the height of its existence prior to the First World War. It was one of the most important features of Nebraska military and social life. Membership was considered a great military honor. Its influence in the Military Department continued strong until just before World War I. After 1915 the Pershing Rifles membership declined as war clouds gathered over Europe. By 1918 the Reserve Officer’s Training Program (ROTC), that had just been established two years earlier in 1916 was suspended. It was temporarily replaced by the Students’ Army Training Corps (SATC) that had the mission of rapidly training and commissioning new officers for service in World War I. As a result the Pershing Rifles were disbanded and its records were burned. The end of World War I saw the disbandment of SATC and the return to campus of ROTC and Pershing Rifles. In 1919 the Pershing Rifles, like the phoenix, was reborn. Out of the ashes of the organization there sprang a corps with new life and activity. As organized in 1919, the Pershing Rifles became an organization for junior officers. Soon however, it regained its status as a fraternal organization for ROTC basic course cadets. The presence of Scabbard and Blade on the Nebraska campus probably prevented its growth as an officer’s organization. The growth of the Pershing Rifles after its reorganization is perhaps even more remarkable than its former decline. By 1924 the prestige of the organization was once again on the rise. This was in no small part due to the popularity of General of the Armies Pershing, now one of the most famous people in the World as the result of his skilled leadership of the American Expeditionary Force in World War I. Special drill units across the nation began to seek admittance into the Pershing Rifles. Meanwhile, in the fall of 1922, a group of advanced course men at Ohio State University joined together and former “The President’s Guard.” It was so named in honor of William Oxely Thompson, President of Ohio State University. The guard preformed an exhibition drill routine on Military Field Day in the spring of 1923. After this performance the unit was disbanded. In the fall of the same year the commander of the local Scabbard and Blade chapter reorganized the unit. Basic course men however, were not admitted. Ohio State University Pershing Riflemen in 1927. In 1925 Ohio State was the first unit outside the University of Nebraska to establish a Pershing Rifles unit, “Company B” which is today Company A-1. This new organization was too loosely organized and too closely connected with the university’s established drill unit for it to stand alone. In the spring of 1924 it applied for affiliation with the Pershing Rifles, but the Nebraska organization refused. The Ohio State group, seeing the need for a national organization for basic course men, threatened to nationalize “The President’s Guard” and leave Nebraska out of it if the two organizations could not work together. Finally, after a year of negotiations, the Nebraska organization approved the formal application for the Ohio State organization. This application was dated 13 May 1925. P/R Captain John A. Ricker, Commander of Company A, installed the Ohio company on 22 May 1925. Thus was inaugurated a new chapter in our history with a policy that welcomed units nationwide into the Pershing Rifles. 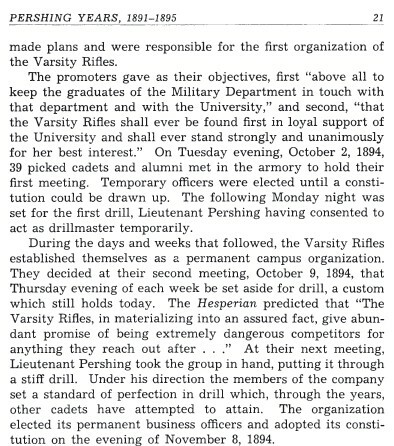 In 1927, Pershing Rifles granted the University of Tennessee’s crack drill unit a charter. This group was designated Company C, and was established under the influence of the Scabbard and Blade chapter located at the school. The year 1928 brought the establishment of an official National Headquarters at the University of Nebraska which was organized along the lines of a US Army Brigade headquarters. P/R Colonel John P. McKnight was our first National Commander. John McKnight became a distinguished lawyer who served in the Nebraska legislature and later saw combat in World War II as a Lieutenant Colonel during the landings at Salerno, Italy and Normandy in France. National Headquarters used 1928 to plan the foundation for an expansion at the company level which would ensure a strong national organization. In the summer of the same year, a number of circulars were sent to universities that did not hold a Pershing Rifles units, inviting their crack drill units to apply for charters from the National Headquarters. Those who knew the value of the Pershing Rifles as an organization capable of promoting interest in drill work for basic students heeded the circulars. During that summer, officers attached to the schools where Pershing Rifles chapters were hosted met with officers from other institutions and as such, the organization received excellent publicity. The first known Pershing Rifles Pledge Manual published by published in 1930 by Karl F. Steinauer at Washington University, St. Louis, MO. 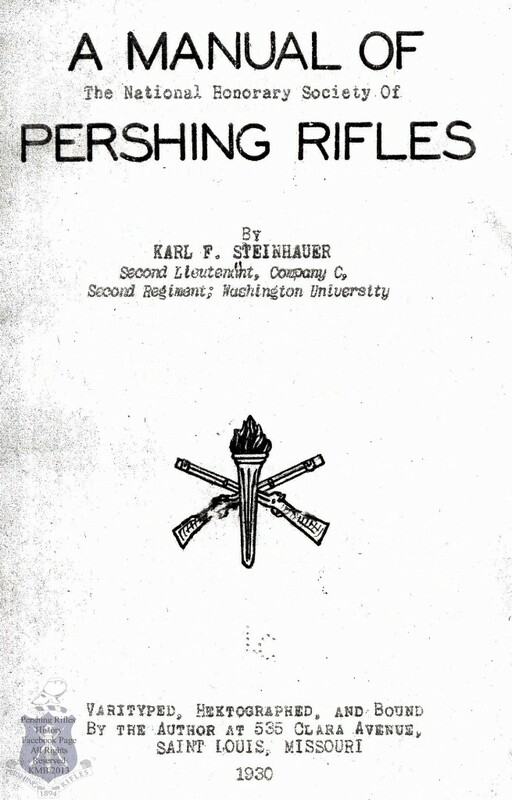 In 1930 the first known Pershing Rifles Pledge Manual was published by Karl F. Steinhauer, a member of Company C-2 at Washington University, Saint Louis, MO. In 1931, John Seigbert Lorr a member of Pershing Rifles Company A-1 at Ohio State University in Columbus, OH copyrighted “The Pershing Rifles Marching Song” and the “Pershing Rifles Sweetheart Song”. The left side of a famous photo of Pershing Riflemen with John J. Pershing at Grant’s Cabin in 1935. Ohio State Fair Grounds, First Brigade Assembly and First Regimental Drill Meet, Pershing Rifles, Columbus, Ohio, May 11th, 1935. From the National Archives. By 1930, Pershing Rifles had expanded so much that our structure was now based on the organization of the World War I US Army Infantry Division. National Headquarters was the Division which commanded three Brigades (1st Bde – Ohio State; 2nd Bde – Tennessee, 3rd Brigade – California) under each were two Regiments for a total of six. Under the regiments were 9 Companies. By 1935 the Pershing Rifles had grown to 22 Companies. On 23 April 1935, General of the Armies Pershing returned to the National Headquarters to meet with the National Staff and the winner of that year’s Pershing Medal. He was keenly interested in the happenings of the Society, including finances, expansion, drill competition, and publications. Pershing maintained a deep and abiding interest in Pershing Rifles for the rest of his life. 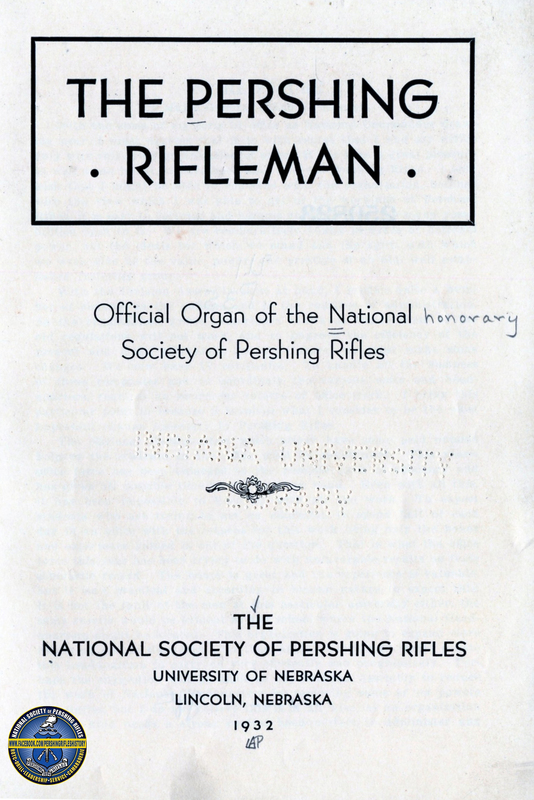 The early 1930s was a time when the The Pershing Rifleman, became our official publication and it continued uninterrupted until 1973, The early 1930s were also a time when the Pershing Rifles crest was developed to promote unity. A small-bore rifle competition was established as a national event and was enthusiastically supported by all units. It continued on for many decades as the P/R National Postal Rifle Competition. The 1930s also saw the establishment of regimental sponsored competitions and social events. Pershing Rifles again closed it’s doors in 1943, this time as a result of World War II. Active and alumni Pershing Riflemen went off to war, serving with distinction and valor. One example is Marine Corps Major Kenneth D. Bailey an alumnus of Company F-3 at the University of Illinois. Major Bailey was Killed in Action on September 26, 1942, on Guadalcanal in the Solomon Islands and posthumous received the Medal of Honor for his valor that day. Another is Army Air Corps Lt Richard Joyce an alumnus of Company A-2 at the University of Nebraska, who piloted a B-25 that bombed Japan as part of the famous Doolittle Raid on 18 April 1942. The Society was reactivated in January 1946. During World War II many Pershing Riflemen were drafted directly from college and served as enlisted men to meet urgent wartime manpower requirements. After the war they returned to finish their college education using their G.I. Bill education benefits. 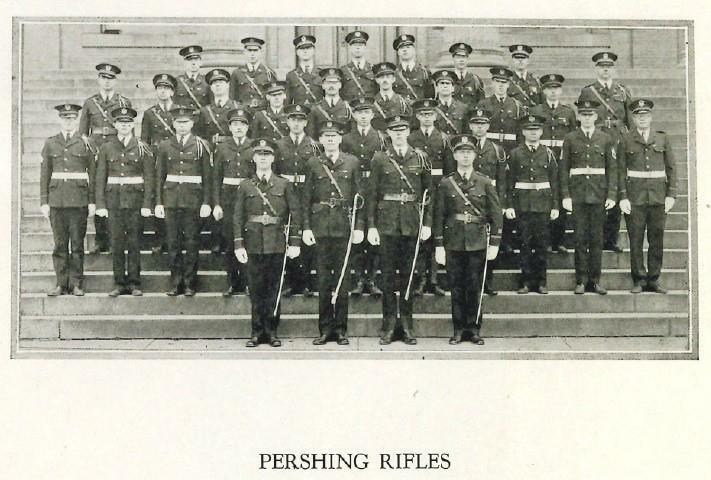 This was this nucleus of military veterans that heralded the rebirth of Pershing Rifles. The late 1940s and the 1950s were years of great expansion for the Society. By 1948, just two years after reactivation, Pershing Rifles had grown to 38 companies in seven Regiments. It was now larger than its prewar strength. By 1957, Pershing Rifles had grown to 130 units in twelve Regiments an over 300% increase in size in just 11 years. With the establishment of a separate US Air Force on 18 September 1947, Air Force ROTC cadets joined the ranks of Pershing Rifles. The Pershing Rifles National Assembly in November 1947 agreed to accept Navy ROTC cadets making the Society a true multi-service organization. 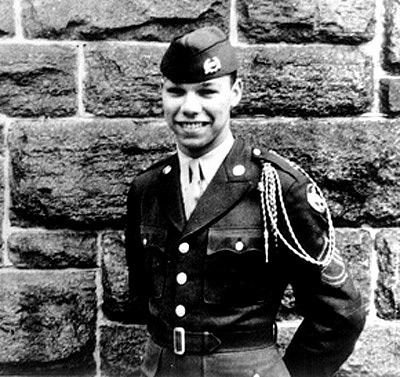 Colin Powell as a Pershing Rifleman in 1954 was a member of Company A-8, City College of New York. The President’s Executive Order 9981 of 26 July 1948 abolished racial discrimination in the US Armed Forces. Pershing Rifles rapidly integrated African American cadets and Historically Black units into the Society. As a result today the Society counts among its alumni many African American military leaders such as General Colin Powell former Chairman of the Joint Chiefs of Staff and US Secretary of State. 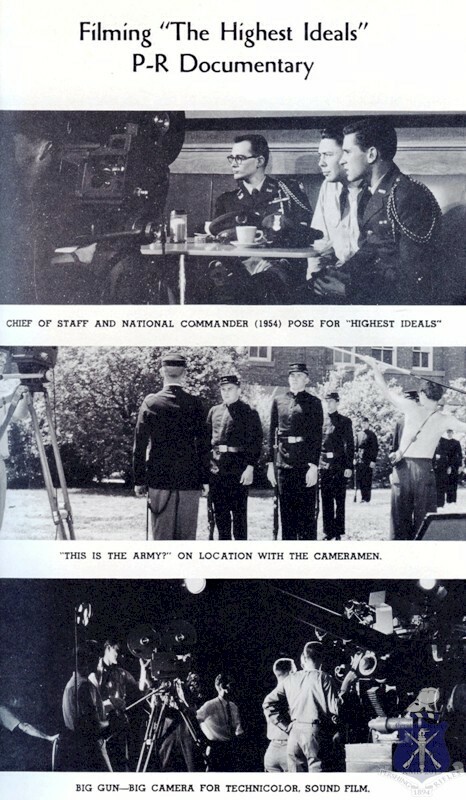 In 1954-55 the National Headquarters filmed a Pershing Rifles Documentary titled “The Highest Ideals” This thirty-minute movie filmed in Technicolor earned Honorable Mention in 1957 by the Annual Inter-collegiate Film Awards sponsored by the Screen Producer’s Guild and Look Magazine. Copies of this film were loaned out to Pershing Rifles units thought the country and used a recruiting tool that described the history and traditions of Pershing Rifles to prospective pledges. Over the next several decades, the Pershing Rifles continued to grow. In 1961, the Society was comprised of 139 active units with nearly 4,100 initiates for that year alone. Several of the 15 active Regimental Headquarters’ had to split into battalions or added inspection teams to help with the ever-increasing numbers. Beginning in 1962, the Army and Air Force ROTC systems began undergoing a change in operation and structure. As such, the Pershing Rifles began to look for new ways to adapt to the changes. Alumni programs were expanded to include the formation of a tri-service advisory board of retired and reserve officers to help guide the Society. Various units from around the country also began to work with high school JROTC units and brought in a parallel organization on that level known as the “Blackjacks.” During the 1964-65 academic year the operational changes in the ROTC program that had rumored in 1962 came into full implementation under the ROTC Reorganization Act. Due to these changes, there were fewer cadets enrolled in ROTC programs to begin with, hence making expansion more difficult, and also impacting the size of Pershing Rifles units. The core of the Society remained strong. Two new Regimental Headquarters’ were added between 1962 and 1965, bringing the number up to seventeen, and the number of units to 149. 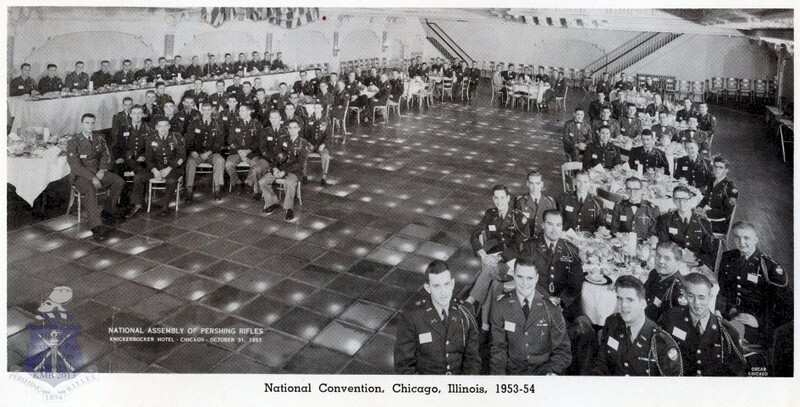 At the 1967 National Convention, the Society officially brought in a second dimension to the Pershing Rifles – the Pershing Rifles Aggressor Force. The Aggressor Force was implemented to encourage the training and development of tactics and bring a combative dimension necessary to mastering the changing world members would enter as military officers. The 5th Regimental Headquarters, hosted by Pennsylvania State University, was charged with drawing up the Standard Operating Procedures and national policy regarding these units. 1969 marked the Pershing Rifles’ 75th anniversary. The organization received salutations from President of the United States, Chief of Staff of the U.S. Air Force General Curtis E. LeMay, and Chairman of the Joint Chiefs of Staff General of the Army Omar N. Bradley. These were published to honor the Society’s history and achievements. The face of the Pershing Rifles continued to evolve with the changes of society. The Pershing Rifles disappeared from many schools following the Vietnam War with the dissolution of ROTC programs and the end of compulsory ROTC basic courses. In response to the shrinking number of units and Riflemen within these units, the National Headquarters increased the emphasis on tactics and marksmanship. By 1974 the Pershing Rifles was organized into thirteen regiments comprised of 137 units. The 1970s saw the introduction of women into the National Society of Pershing Rifles, with the first female pledge at Company L-4 (North Carolina State University) in 1971 and the first female active member from M-16 (Florida State University) a year later. This does not however, imply a lack of participation or association with the Pershing Rifles before the 1970s. The Co-Ed Affiliates of Pershing Rifles (CAPERS) had established units along side Pershing Rifles units for decades. Even earlier, a sponsor was often chosen as an honorary addition to various staffs. When the Society opened its doors to women, members of CAPERS units were invited to join. In 1980 the Pershing Rifles selected its first female commander, P/R Major General Paula R. Harmon. During the same decade, units across the nation increased focus on different aspects; some marksmanship, others tactics and hostage situation training, while still other held true to the foundation of the Society, armed exhibition drill. Competitions were held for each of those activities throughout the year with the drill competition still taking the spotlight. In celebration of its 90th Anniversary, the Governor of Nebraska presented a citation for outstanding service to the State as well as declaring a week in March to be Pershing Rifles week. In the early 1990s increases in participation were seen through more regimental sponsored competitions and social events. Expansion efforts continued throughout the decade in spite of fluctuations in active units. Following managerial problems at the regimental level, the National Legislative Body dissolved all Regimental Headquarters’ in 1997. Discovering that rather than solving problems, the removal of this level of command increased problems, especially in communication, camaraderie, and participation at national events, Regimental Commands were re-established starting with the 8th Regimental Headquarters in 2001. The 1st, 4th, 12th, and 17th Regimental Headquarters’ followed suit in 2002-2003, with the 2nd Regimental Headquarters being established a year later. The late 70s through the 1990s was a period where the number of Pershing Rifles units continued to decline. After Desert Storm both the US Military and Pershing Rifles were hard pressed to attract members. However the spirit, strength and traditions of the Society continued on in a few strong Pershing Rifles units across the country. The 9/11 attacks created a groundswell of support for the US Military brought on by a new spirit of patriotism in the American public which was echoed in the sense of duty and service amongst college students which has sustained the growth of Pershing Rifles from 2001 to present. After more than 120 years Pershing Rifles is going strong and continues to inspire students and create future leaders in the military, business, industry and the arts. Excellent to have this all in one place and easy to view. Thanks, It’s still a work in progress. @Historian, I’m a bit curious of this new October 2, 1894 founding date. There has been talks with many alumni who have been in the organization for 30-40 years who also have never heard of this date. Although an actual, established founding date is needed, would you be able to share where you received the documentation for this information? 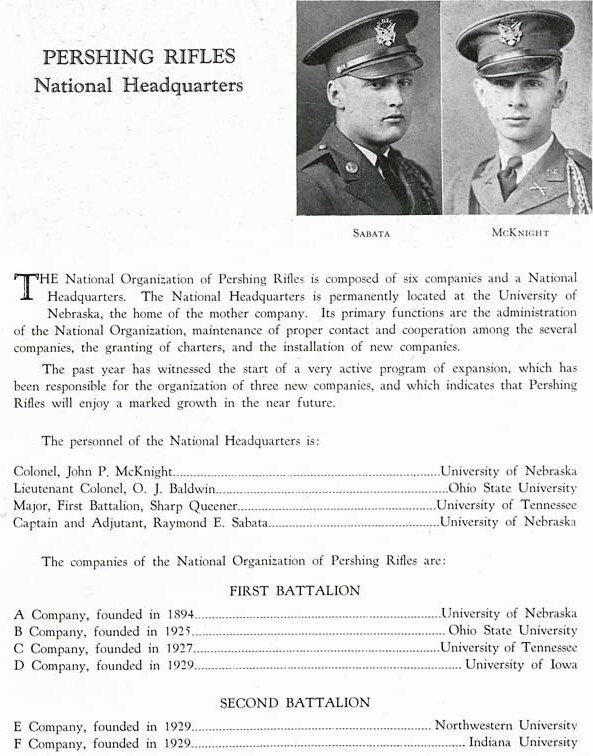 That date is cited as the founding date for Pershing Rifles on page 21 of the 1941 history of the University of Nebraska ROTC Department. Does anyone know what became of the Omaha Cup? The Omaha Cup was found and returned to the University of Nebraska – Lincoln earlier this year. It is currently at the Pershing Museum in Laclede, MO. Dear Jarod: I can’t begin to tell you how excited and pleased I was to receive your email regarding the Omaha Cup. I spent hours beyond count, off and on, over a span of 30 plus years writing letters, going through files at the Archives and reading through newspaper microfilm trying to get some hint as to what had become of it. Would you be so kind as to fill me in on how and where it discovered? Thanks. The Omaha Cup was found recently by a woman cleaning out the house of her aunt who had passed away nearly twenty years ago. She graciously agreed to return the cup to the University of Nebraska – Lincoln ROTC department. 1955- 1959. I was the 7th Regimential Commander, cadet Colonel 1959. BG Pat Kuncil was the national commander.He died in Ranger School accident.